Grace grew up in Louisiana and has been doing some form of art for as long as she can remember. “Painting, sketching in school,” she recalls. She has been winning awards since she was in elementary school and 4H Clubs. She sells her paintings and crafts now, of course, but this is nothing new. Back in the day, back in elementary school, she sold her art for quarters to the other kids. 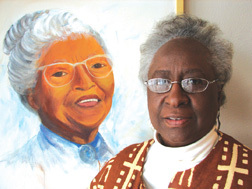 After high school, Grace attended Southern University for a year and then made her way to Toledo with her husband … and continued her painting, sculpture, greeting cards, ceramics, and so on. In fact, her first paintings were done on ceramics, such as cookie jars (she was once dubbed “the cookie jar lady”), when she eventually decided that if she could paint on ceramic, she could paint on canvas – so she did exactly that. Fifteen years ago, she started her canvas work in different styles – abstract, surrealism, portraits. Obviously, there are no limits for the cookie jar lady.